Ordering the correct type of weld that you want on your hollow metal frames can save you time and money. While there are a few industry standards, these are somewhat out of date and not required with advancement in frame fabrication technology. We often see two types of welded frames for most of our projects. 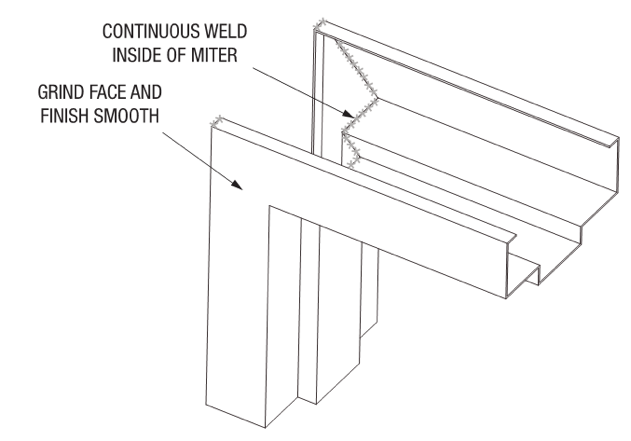 In this post, we’ll discuss the differences between continuously (or fully welded profiles) vs. continuous face or miter welds. Regardless, the face of the frame should be smooth and free from joints, defects, and blemishes. 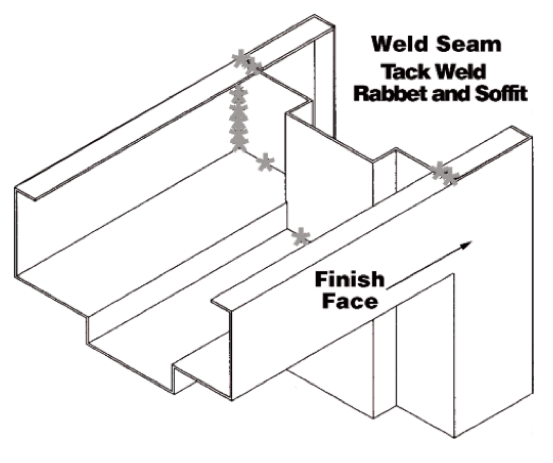 Let’s review the two commonly specified welds for hollow metal frame joints. As defined by The Steel Door Institute, continuous or full profile welded frames require face and back welding of butted or miter joints. This application includes extensive welding and hand grinding after the welding to ensure a seamless look. The clear advantage of this type of weld is that it prohibits light and air to penetrate the gaps of the meeting edges. It also creates a strong bond at the corners of the frame, but if not done properly could cause warping or twisting at the meeting joints. While keeping light and air out is great, there are a few disadvantages to this process. It’s labor intensive, due to welding of hard to reach corners and joints. Welds can penetrate through the frame and leave metal pockets in corners, which then need to be hand ground with specialty grinding tools. This adds unwarranted cost to the project where other fabrication and welding techniques will work and produce the same results. This welding process could be spelled out for large or oversized openings that have higher stresses occurring at the meeting joints during transportation. Or it may be necessary on heavy frames such as lead-lined openings or extreme high-frequency openings. This type of weld is the most common type of welded frame. 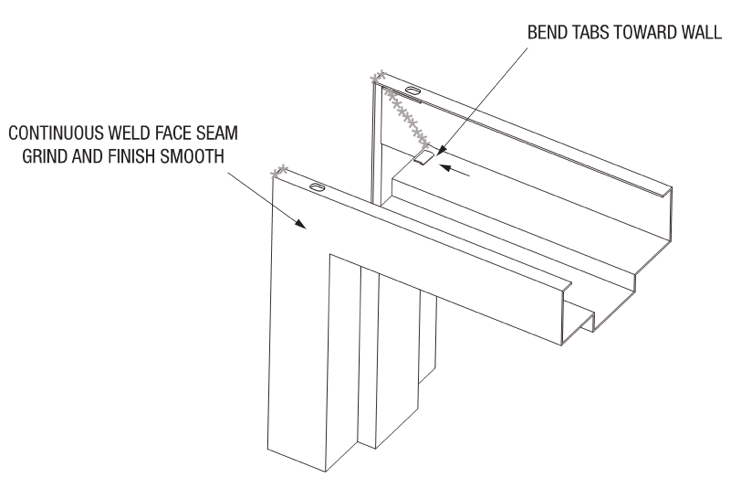 According to the Steel Door Institute, the joints between the head and jamb faces have a continuous weld on the visible side of both faces only. The back side of the frame then has interlocking tabs, or tack welds, holding the frame together. The advantages of face welded frames are less labor for welding, less grinding and finishing, the frames are easier to cut apart in case re-fabrication is required, and squaring and assembly of the frame is a quicker process. Even though the labor cost is reduced, the face welded frames provide similar strength and reliability as fully welded frames. If you chose this option, the specification should call out for interlocking tabs from the manufacturer or tack welded joints during fabrication. This will ensure the meeting joints do not separate while your frame is being shipped or is under stress. While there aren’t many downfalls to this type of weld, there is one extra step you’ll want to take. If the joints need to be sealed against water, air or light you can specify a continuously caulk back joint. The results are the same and save time, labor, and materials of a fully welded frame. When selecting the gage of a frame, one should also take into account the fabrication and welding process and whether the project’s budget can afford a fully welded profile. If budget is a concern, it may be best to specify a face welded with interlocking tabs with sealed back joints with caulk. The material cost is similar, so one should consider the labor cost impact when selecting how your frame is fabricated. Our team is fully capable of completing either of these welds in our fabrication center. Give us a call today, (402) 464-6348, for all your fabrication needs.